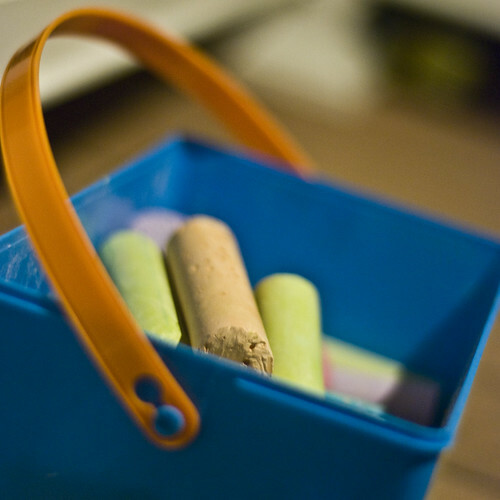 Soft Chalk (103/365 year 3) – Annoyingly Boring? Not sure what’s going on, but seems the last several days my shots have not been particularly crisp. Now, I’d expect a softness to most of this photo as I went with a shallow depth of field, but the orange piece of chalk in the bucked was my focal point and I expected it to be sharper. Time for a cleaning? Something else? Is it the same lens giving you soft results each time? Could need an autofocus adjustment… some cameras you can DIY, not sure about yours… One of the folks in my class was having a similar issue with her Canon the other day. Camera shake? Try it on a tripod & see if you still don’t get sharp focus…. Or maybe you’re just so close, your DOF is super-tiny…?